Survivor: Ghost Island (2018) - 9th place, 12th out - 5th juror. 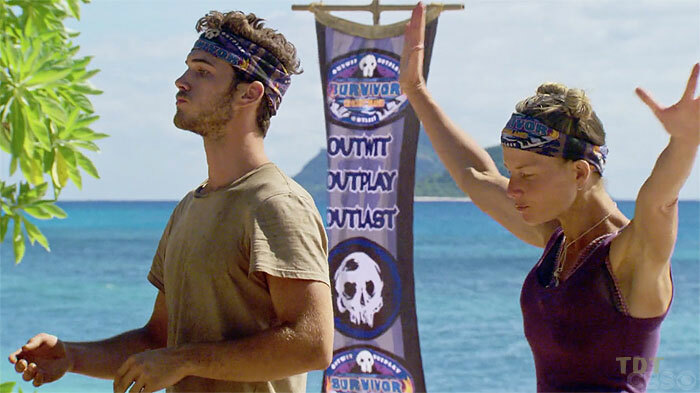 Voted out in Episode 11, "The Finish Line is in Sight" (Day 29). Ghost Island Ep. 2 RC/IC: "Coming Up for Air" - Crosses obstacles and dives to release buoys, but Malolo loses again. Ghost Island Ep. 3 RC/IC: "All Along the Watchtower" - Now with Malolo, works the puzzle, and Malolo wins! Ghost Island Ep. 4 RC: "Water Slaughter" - With Brendan, scores one point (not shown) and loses one; Malolo loses. Ghost Island Ep. 5 RC: "Rod Screw-It" - Helps move the giant sandbags to pull the lever, but Malolo loses again. Ghost Island Ep. 5 IC: "Hitch a Ride" - Helps turns the crank, but... Malolo loses, once again. Ghost Island Ep. 6 IC: "Sir Duke" - Still with Malolo, tethered to James; Malolo blows a huge lead, loses (3rd/3). Ghost Island Ep. 7 RC: "Discy Business" - Helps hold and stack, but Malolo loses (3rd/3). Ghost Island Ep. 7 IC: "Cruel Sea" - Tosses all the rings, and Malolo somehow doesn't lose (2nd*/3). Ghost Island Ep. 9 RC: "Gone Shootin'" - Hits two targets, but his orange team loses, 6-4. Ghost Island Ep. 10 RC: "Caged Tigers" - Paddles the boat, helps with the puzzle, and the orange team wins. Ghost Island Ep. 8 IC: "Audio Slave" - Seventh person to drop out, on the transition to the final stage (7th/13). Ghost Island Ep. 9 IC: "Fijian Feast" - Makes it to the final round, but loses to Angela (2nd/12). Ghost Island Ep. 10 IC: "Take the Reins" - Eighth person to drop out, just under 10 minutes in (4th/11). Ghost Island Ep. 11 IC: "Crocodile Rock" - Second person (in orange, and overall) to drop out (4th/5). Ghost Island, Ep. 1 RC: "Chief's Choice" - Runs the obstacle course to collect keys; Malolo wins by forfeit. Ghost Island, Ep. 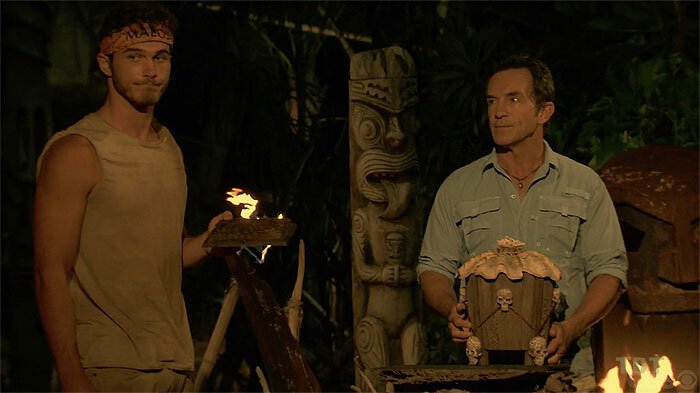 3: With Brendan, finds the Malolo hidden idol (originally held by James in China; Day 8). Ghost Island, Ep. 4: After claiming the idol protects two people, plays it for Stephanie (but she received no votes). Ghost Island, Ep. 7: Shortly after James's boot, finds the new Malolo idol (it's Jason Siska's f***ing stick; Day 18). Ghost Island, Ep. 9: Plays his idol, saving himself (while booting Libby), and voiding seven votes (Day 25). Ghost Island, Ep. 6: James Lim (voted out, 4-1). Ghost Island, Ep. 2: One vote, from Jacob. Ghost Island, Ep. 10: Two votes, from Chelsea and Desiree. Ghost Island, Ep. 11: Two votes, from Domenick and Wendell (voted out, 2-2-1-1 [3-0 on revote]). It's James's idol from Survivor: China! About to land the non-losing shot? How did we lose this thing, guys? Erin Cebula at ET Canada (1/31/18): "Michael Yerger Isn't What He Seems"
Gordon Holmes at XfinityTV.com (2/5/18): "Michael - 'I Can Tell Who the Good Guys Are and Who the Bad Guys Are'"
Josh Wigler at The Hollywood Reporter (2/17/18): "Meet Michael Yerger"
Dalton Ross at EW.com (2/20/18): "Meet Michael in 60 seconds"
Dalton Ross at EW.com (5/3/18): "Michael Yerger says Kellyn never asked to see his idol"
Josh Wigler at The Hollywood Reporter (5/3/18): "Michael and Jenna on the 'Discouraging' Malolo Curse"
Gordon Holmes at XfinityTV.com (5/3/18): "Michael - '(Kellyn) Never Once Asked Me to See the Idol'"
Mike Bloom at Parade.com (5/3/18): "Michael Yerger Discusses His Eighteen Lives in the Game"
Rob Cesternino at RHAP (5/3/18): "Double Exit Interview - 5/03/18"
"Hobbies: Health, fitness, luxury and exotic cars, outdoor activities (camping, hiking, swimming), traveling, concerts/festivals, and architecture/design. Pet peeves: Incompetent drivers, negativity, and rain/cold. What's your personal claim to fame? Earning Eagle Scout, the highest achievement or rank attainable in the Boy Scouting Program of the Boy Scouts of America. If you could have three things on the island, what would they be and why? Hot sauce, boomerang, skittles. Which Survivor contestant are you most like? Malcolm Freberg—I'd be inwardly strategic and aggressive but outwardly friendly and easy-going. Why do you think you'll "survive" Survivor? Because I'm a people person. I've always preferred to spend my time around others over being alone. I feel as though I can relate to those of all ages from all walks of life in some way in order to form common ground."